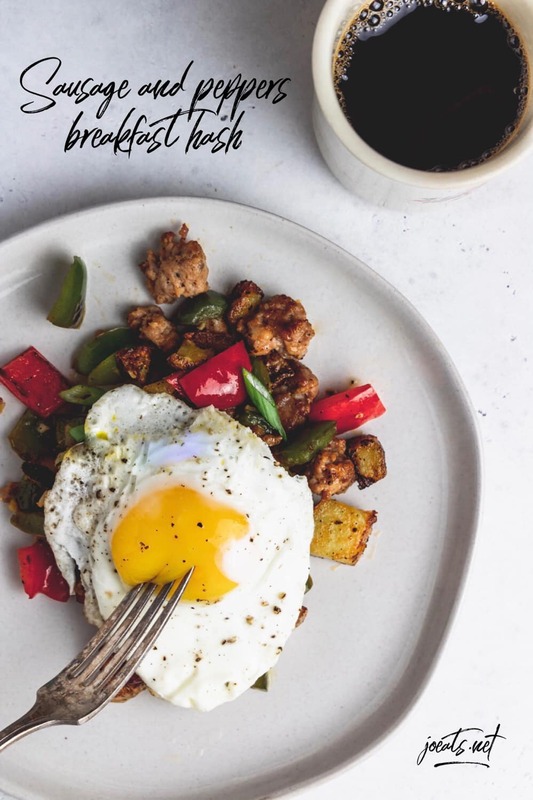 Crispy potatoes, sausage, and peppers make this easy breakfast hash my favorite way to clean out the fridge, get a meal on the table, and do as few dishes as possible. One of life’s (or at least my life’s) biggest quandaries when it comes to breakfast has got to be sweet or savory. At diners I often get overtly anxious at the idea of having to choose between the two. Of course I know I could get both, but then the “they’re judging me for over-ordering” neuroses kick in and well basically it gets messy. Most of the time though I fall back on savory, because ultimately, it’s what I want out of breakfast, and out of life. 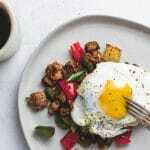 Don’t get me wrong, I love a good waffle or a nice fluffy stack of pancakes, but my heart really sings for runny yolked eggs, breakfast meats, and all the crispy, crunchy potatoes. So now that I’m clearly in the realm of all things savory – where to next? Well, that’s where you all come in. 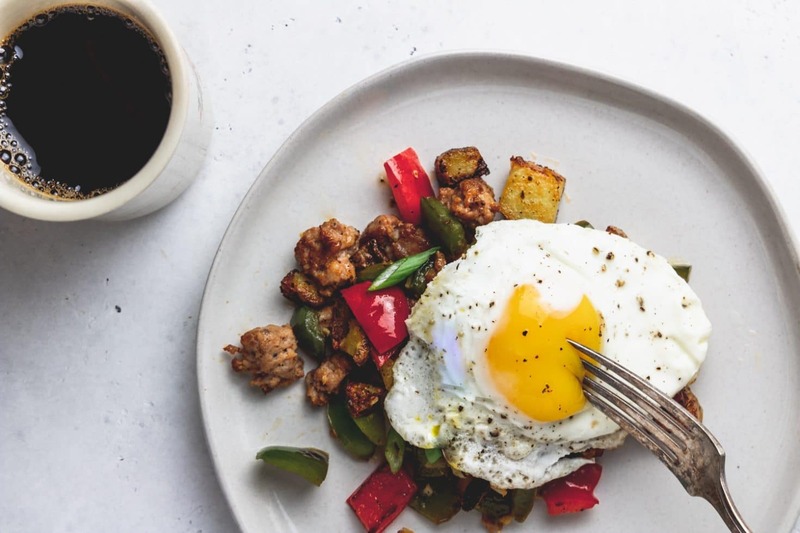 I made this sausage and peppers breakfast hash on my IG stories a couple weeks ago and there was an overwhelming number of you who wanted the deets. And because it came from you I’m obviously going to do it. Unless of course it involved something nutso like bungee jumping or crunchy peanut butter. This is one of my all time favorites. We eat this for breakfast, brunch, or dinner. It’s comforting and homey, but takes about 30 minutes to throw together. And you can eat directly out of the skillet. The other great thing about this recipe is that, like a lot of dishes I love, it’s more about the method than the actual recipe itself. 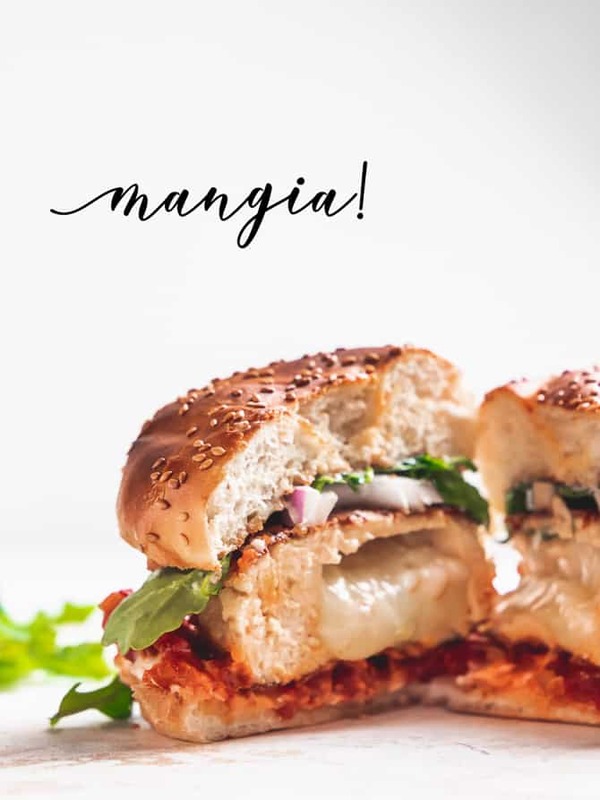 I was going for a sausage and peppers hoagie vibe with this, but the iterations are only limited by your imagination. A bacon and mushroom hash with some melty gruyere cheese and soft scrambled eggs sounds amazing – like seriously that might be what we have for dinner tonight. Or maybe chorizo and corn with pepper jack is more your style. This dish is all about the method, so the particulars are really up to you. That being said, one item is non-negotiable and that is a foundational layer of beautifully crunchy, well seasoned, golden brown potatoes. If a salty, crispy pile of breakfast potatoes doesn’t make your heart skip at least a bit of a beat, this may not be the recipe for you. But if you are like me (or pretty much anyone else I know IRL) then you can’t get enough of a golden brown potato, perhaps dunked in ketchup. To be honest, it took me a long time to get breakfast potatoes quite right. Usually the issue stemmed from hitting them with too much heat up front which resulted in beautifully brown and crispy exteriors which hid slightly bland, definitely under-cooked middles. But once I got that problem resolved, I realized that making the best breakfast potatoes took longer than I really wanted to wait to eat breakfast. So basically I needed a short cut. Short answer? Use a microwave. Now obviously you’re never going to get a crunchy potato that way. But what you will get is a potato that’s cooked through to the middle, and that has released some of its starch. And it’s that outside layer of starch that comes in real handy for quick and easy browning. The method I use essentially steams the potatoes in the microwave until they’re just barely tender. Then you toss them into a well-oiled, screaming hot cast iron skillet to brown up for a couple minutes on each side. Yes, you have to use an extra bowl, but think about what you’re getting in return – perfectly crispy on the outside, soft in the middle, breakfast potatoes that are done in less than 15 minutes. What else can I do to make the best breakfast potatoes? 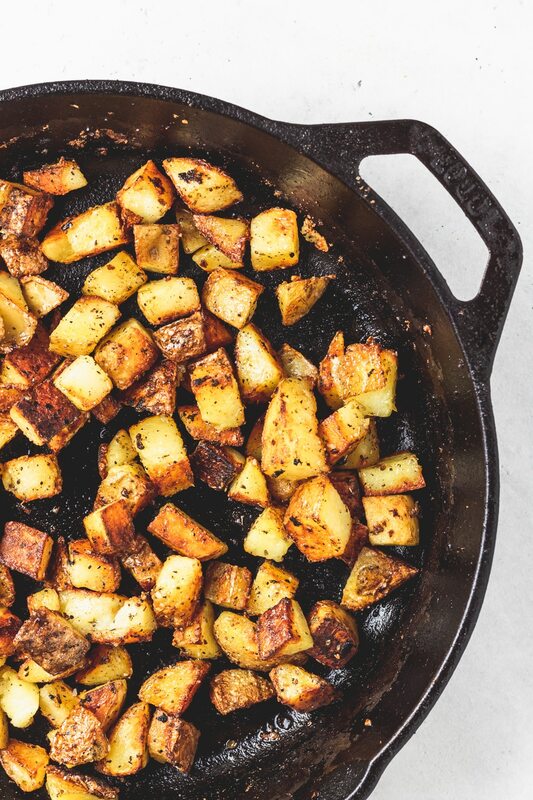 A few other helpful tips to making sure you get beautifully browned breakfast potatoes each and every time. Cut them all (roughly) the same size – if one potato is really big and another is very small, you run the risk of undercooking one while overcooking the other. Use enough oil to coat the bottom of the pan – this is by no means deep frying, but you will need a good slick of oil in your skillet to ensure a crispy situation. Cast iron is best – but not 100% necessary. If you have one though, use it. Salt is your friend – potatoes need a lot of it to taste good, try not to be alarmed. Ok ok, so what about the rest of it? Well honestly, if you’ve got the potato thing down, you’re 90% there. The rest is just a little chopping, some saute action, and a bit of timing. The method goes a little like this. Cook your sausage (or alternate breakfast meat option) in your cast iron. 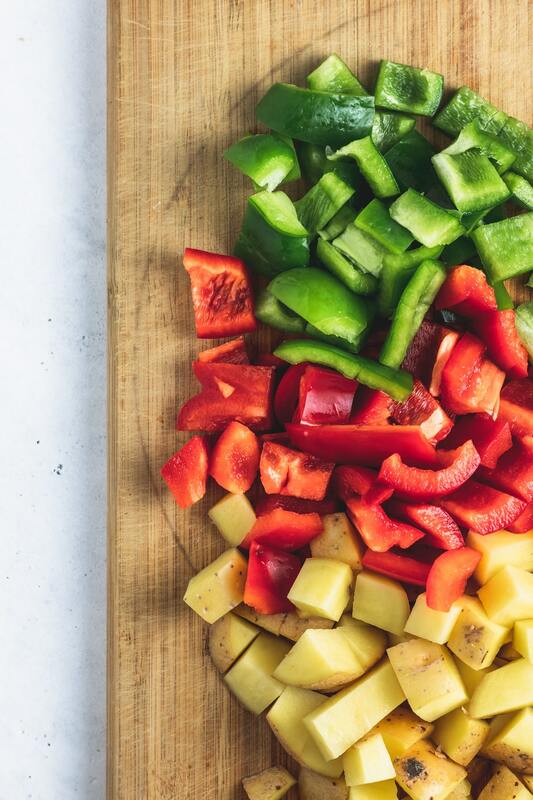 While it’s browning up, chop your veggies. Then toss those veggies in with the meat, season with salt, spices, etc, and cook until they just start to soften. While that is happening, dice your potatoes and get them in the microwave for a few minutes. By the time they’ve steamed to just about tender, the sausage-veggie mixture can be transferred to a plate and set aside. Next, crank the heat, add some oil, and dump in your potatoes. Get them crispy on one side, flip, and let them brown up on the other. While those are becoming an unstoppable, crispy, crunchy force of nature, cook your eggs. Yes, I do this in a separate pan. Why? 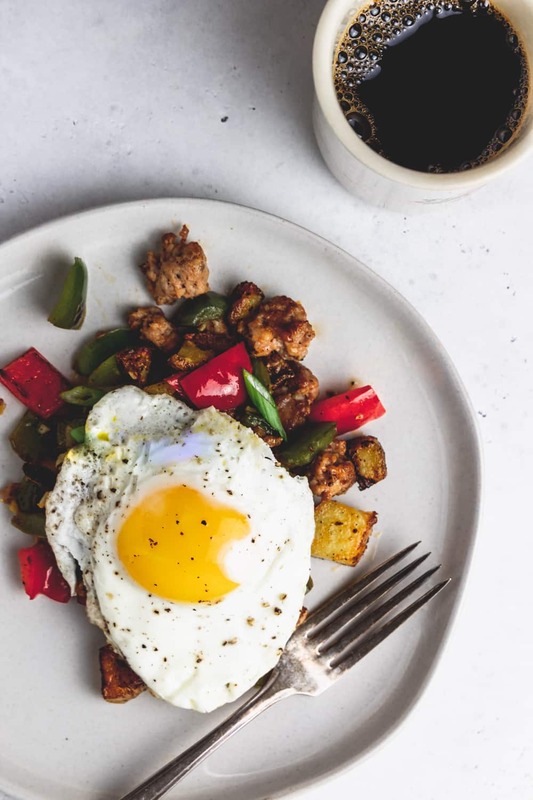 Because eggs should be done at the last minute (so the yolks stay runny and nothing gets cold) and because it’s ten times faster to fry an egg on the stove then it is to crack it over your hash, cover, and let the egg slowly steam in the residual heat of the pan. 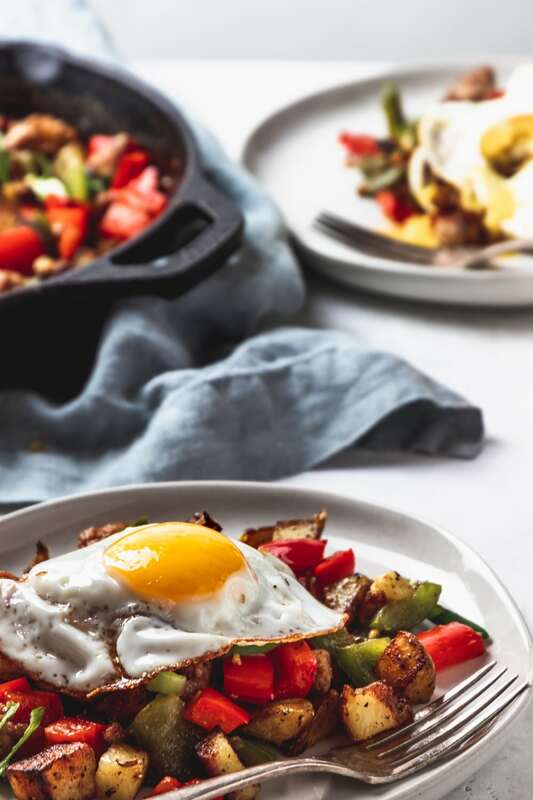 Then at the very last minute, toss your veggies and sausage back in with the potatoes, top with the eggs, and serve immediately – on plates or straight out of the skillet. And don’t forget the hot sauce! So thank you, friends, for reaching out about what you want to see on the blog, because this one is GOLDEN and you are SO SMART for suggesting it. Now go ahead and make it, snap a pic, and tag me in it so I can drool over all of your breakfasty concoctions. Happy Tuesday! 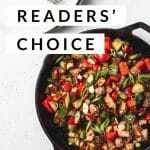 By popular demand – here is a simple, easy, delicious recipe for my favorite sausage and peppers breakfast hash. Perfect for breakfast (duh) or breakfast for dinner – you can have this on the table in under 30 minutes! Brown the sausage in a large skillet, set over medium-high heat for about 5 minutes, using a spatula to break up any large pieces. 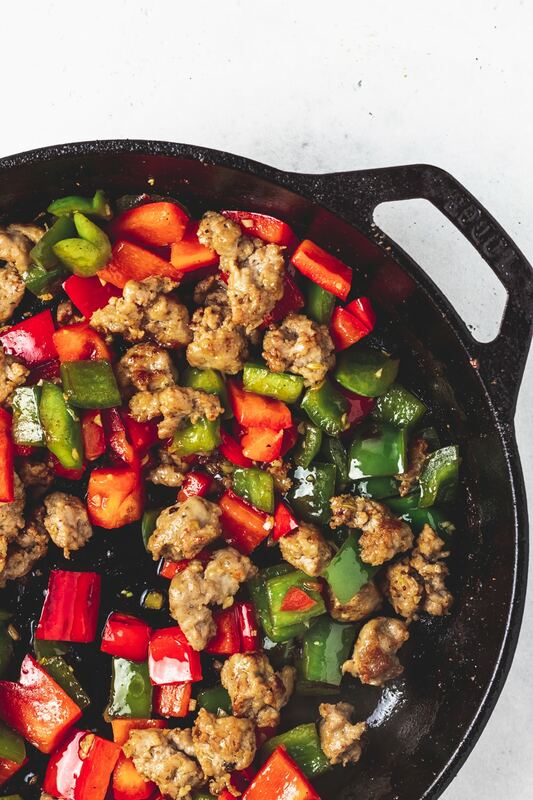 While your sausage cooks, dice your bell peppers and mince your garlic. When sausage is brown, add the bell peppers along with 1/2 tsp of kosher salt and black pepper as well as dried oregano. Stir and cook until peppers begin to soften and take on a little color – about five minutes. Add the garlic and cook for 30 more seconds. Transfer everything to a plate and set aside. 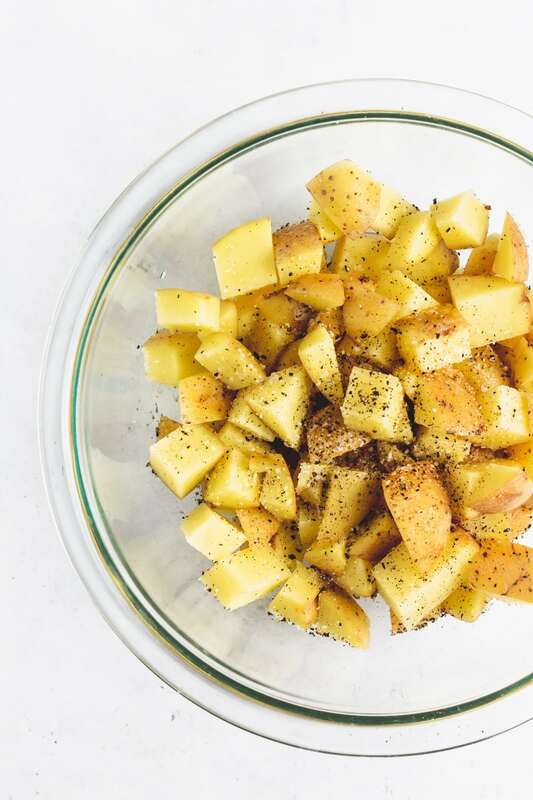 While your peppers cook, chop your potatoes into 1/2 inch cubes. Transfer them to a microwave safe bowl, drizzle one tablespoon of olive oil over them, and season with 1 teaspoon kosher salt and a few grinds of black pepper. Cover with plastic wrap (or a microwave safe plate) and nuke on high for four minutes. Add one tablespoon of the remaining oil to your pan. Carefully pull the plastic wrap off of your bowl of potatoes (it will be very steamy and hot!). Then dump the potatoes into your skillet. Use a spatula to press them gently into one even layer and let cook, undisturbed for 3 minutes. Flip potatoes once they begin to brown on one side, pat down into an even layer again, and cook for another 3 minutes. While your potatoes cook on the second side, heat the last tablespoon of olive oil in a separate skillet and fry four eggs. I like to use this method because it’s pretty fool proof, but you do whatever feels right to you. This would be a good time to slice your scallions for garnishing. 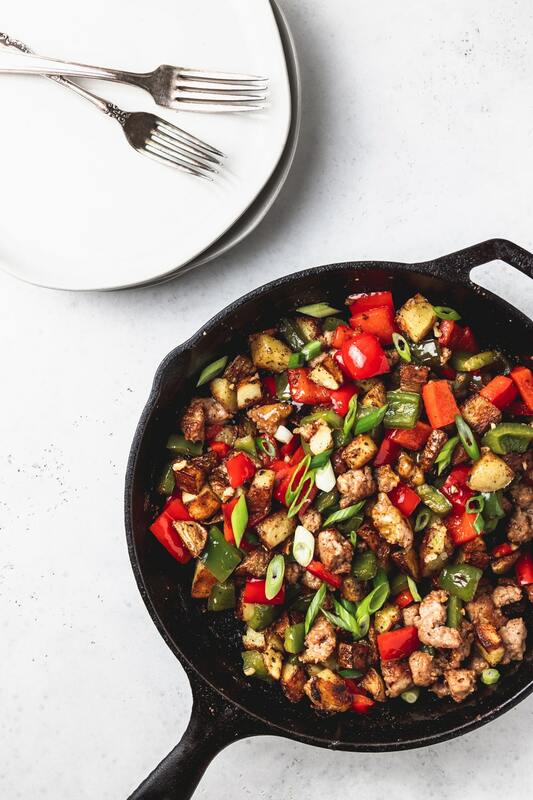 Right before serving, gently fold your reserved sausage and peppers mixture into your crispy potatoes. Then divide between four plates, top each one with an egg, and garnish with sliced scallions. Yes! I need this in my life! Thanks for sharing. Happy to. I think we can all agree that breakfast is better when shared!